The newly developed DX series of paperless recorders features a maximum of 30 analog input channels, removable storage media, various graphical options, IEC529-IP65 compliance, and networking capability. 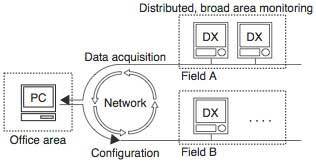 The DX series of recorders allows for the configuration of a distributed data acquisition system over a network. This paper outlines the key features of the DAQSTATION DX100/200 series. Test & Measurement Business Div. Yokogawa Electric Corporation released the µR and VR series of industrial recorders to meet user demands for monitoring and recording field data. Since then, the recorders have been in wide use in a variety of industries. Demand for more advanced monitoring and control has increased, however, as the key issues companies face, such as reductions in the total cost of ownership (TCO) and improvements in efficiency and quality control, increase in number. The amount of data to be monitored and recorded is on the constant increase as well. Accordingly, an information handling system, which is a hierarchy of a field layer, monitoring and control system layer, production control layer and information system layer, has to deal with these vast amounts of data. For the system to be able to process the data, field devices are required to be more intelligent and have added-value functionality, such as failure detection and statistical analysis; in other words, the ability to convey "information" —not just data alone. Now it is possible to share "information" at private-sector levels due to the advance of information and communication technology. Consequently, companies are trying to shift from a conventional hierarchical system to an independent distributed system organized on a single level. In order to help realize such a distributed monitoring environment, we have developed the DAQSTATION DX100/ 200 series of compact paperless recorders which are packed with measurement, display, storage, analysis, information and communication functions. Figure 1 shows an external view of two models of the DAQSTATION DX100/200 series. Equipped standard with Ethernet interface. With the client-server function of FTP (File Transfer Protocol), it is possible to transfer files from a remote location and perform dual- redundant storage of data. Supports both RS-232 and RS-422-A/485 communication standards. Also supports MODBUS protocol, in addition to conventional dedicated protocols. Support for flash memory cards and ZIP disks facilitates the storage of a large mass of data. Provides bar-graph, digital and overview screens appropriate for monitoring, in addition to trend screens. Incorporates a dust- and drip-proof construction compliant to IEC529-IP65 standard for durability to harsh installation environment. Employs DAQEXPLORER PC-based software for effective use of DAQSTATION's network functions. Figure 2 shows the hardware configuration of the DAQSTATION DX100/200 series. The DX series contains a pair of 32-bit CPUs to enable multi-channel computing and display. If a master-slave CPU configuration is employed, the functions that can be undertaken by the master and slave CPUs respectively become restrictive, usually resulting in an increase in the load on either side. In the case of the DX series, almost all hardware resources, including memory and communication interfaces, are located on the common bus. This design approach was taken to enable each CPU to have exactly the same access to resources of memory space. Consequently, users can expect optimal load distribution even when future functions are added. The CPUs provide the operation and timing control processes of multiplexers and A/D converters as tables in memory beforehand. The tables are then fed automatically to the A/D conversion block by means of dedicated hardware. With this method, we were able to reduce the switching time dramatically, compared with that in earlier cases where a CPU directly controlled the operation and timing of those devices by means of software. This method also enabled us to increase the number of input channels that can be handled by a single A/D converter for a given time unit, up to 2 channels/125 ms or 12 channels/s, twice the number handled in earlier models. The DX series of paperless recorders is equipped standard with a 10BaseT Ethernet interface. The recorders therefore can easily be adapted to any new network environment, as well as connected to any existing network environments. The DX series also comes with the TCP/IP internet-standard communication protocol. Consequently, the DX series supports LAN/WAN (Local Area Network/Wide Area Network) environments on a large scale, allowing the functions of the DX series to be accessed from a variety of operating systems, such as UNIX and Windows. Table 1 summarizes available communication functions. With Ethernet communication, users can set up and control the recorder and output measurements using protocols dedicated to the DX series. It is also possible to automatically transfer data created in internal memory using FTP-based file transfer functions and acquire data stored in external storage media. Other functions include the capability of adding a general- purpose serial interface, and allowing users to set up and control the recorder and output measurements using protocols dedicated to the DX series. Furthermore, users can carry out communi- cation using the MODBUS protocol (RTU SLAVE). With all these communication functions, the DX series is expected to offer an even wider range of applications, as described below. By installing a LAN, it becomes possible for an operator or operators in an office to centrally monitor DX series of recorders located separately in a number of factories. Furthermore, by installing a WAN, users can monitor DX series recorders located in a remote place. In addition, users can perform, by remote control, almost all settings and operations, except turning on/off the power and replacing storage media. This feature therefore will permit central control (Figure 3). 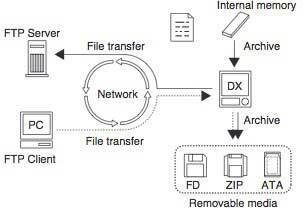 Using the FTP server functions of the DX series, users can transfer files of various sorts of data stored in external storage media, as necessary. Standard FTP client software is available for connection to such storage media. If the client functions of the DX series are used, the recorder stores data created in internal memory in an external storage medium at the same time when the recorder automatically sends the same data to a remote FTP server. Thus, users can make their data storage dual-redundant in anticipation of possible failures in the external storage medium (Figure 4). As display units, the DX100 and DX200 series employ 5.5-in. and 10.4-in. wide-view, TFT color LCDs, respectively. A variety of sophisticated ideas have been incorporated in the display, to allow for easy-to-understand, versatile views of information to be displayed. Available display formats include screens for monitoring the alarm status, such as the newly added overview screen, in addition to the existing screens for monitoring data, such as trend, digital and bar-graph screens. This realization of a variety of display formats enables varying monitoring needs to be met in a flexible way. Additionally, the DX200 series has a function for showing a split screen that takes advantage of the large 10.4-in. display. This screen can show a user-defined, flexible combination of multiple windows. Consequently, users can set screen layouts to suit their particular applications (Figure 5). A pop-up menu system has been employed for an operator to work with screens on the display, and appear only when the operator works with screens. The system lets the menus pop up upon a single action of the operator. We were able to make the menu size large enough to ensure the required performance of screen operation since menus need to be shown only at the moment of screen operation. In addition, the menu box lists all options to present an easy-to-view, easy-to-understand menu and provide excellent operability (Figure 6). Recording paper used with conventional chart recorders has also served as a storage medium. As alternative storage means, the DX series employs flash ROM, which is non-volatile, semiconductor memory. The DX series is designed to retain min-max values, which are obtained over a specific time interval, to ensure the same level of display quality as that of conventional chart recorders. In addition, by using memory as small as 1.2 MB, we were able to store about one month's worth of data, which is a typical chart replacement cycle. Now it is possible to record data for even longer periods of time by equipping the DX series with a large- capacity storage device, such as a flash card or ZIP disk drive. We provide the networking-capable DAQEXPLORER software package, in addition to setting, display and data logging software. DX Desktop, the DX management software, allows users to transfer data and setup information distributed over a network and held by the DX series using a drag-and-drop operation. With this software, it is possible to manage data files easily without having to be aware of the presence of the network. 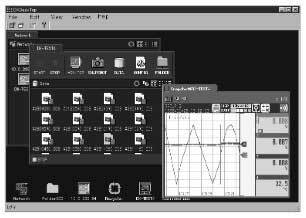 In addition, the DX series has a snapshot function, for simple monitoring, that saves the current screen as an image file. The software package also includes Realtime Monitor which allows users to monitor field data in online mode and in real-time. We also provide the DAQLOGGER real-time logging software. 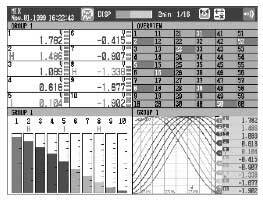 This software is especially suited for a system that comprises not only DX series recorders but also recorders in the conventional µR and VR series. In other words, the software is suited for a system that contains two or more different types of recorder models and/or communication methods. 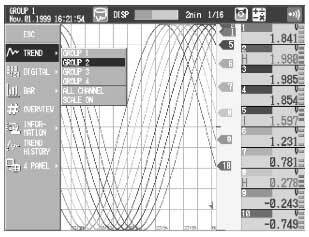 Figure 7 shows an example of a screen presented by the DX Desktop software. The DX series has a dust- and drip-proof design that complies with the IEC529-IP65 standard. 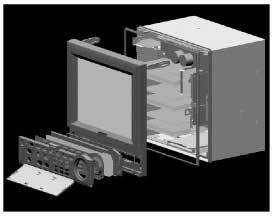 This design was adopted because it is anticipated that the recorder may be built into systems requiring dust- and drip-proof capabilities, such as food or pharmaceutical manufacturing equipment. This design prevents dust particles and water drops entering the keyboard block, as well as such internal mechanisms as the floppy disk drive. The design is also effective in protecting disks that are especially vulnerable to dust contamination. Thus the DX series lends itself to use over a prolonged period. Figure 8 shows how the DX series is constructed. The lower section of the front panel is comprized of two layers. There is an operation keyboard inside the outer layer. The keyboard in front of the inner layer is formed of an integral rubber sheet which is in close contact with the casing. A gasket is inserted between the inner layer and the front bezel to protect the recorder's internal assembly. A transparent acryl plate is adhered onto the front bezel to prevent dust particles and water drops entering, as well as protect the surfaces of the LCD. The backside of the front panel is protected by a gasket running around the front bezel. In this paper, we have explained the most characteristic features of the DAQSTATIONDX 100/200 series. We expect the users to take advantage of the networking capability, memory functions and display functions; needless to say the capability of replacing conventional chart recorders as paperless recording instruments. As a result, we are confident the DX series will play a key role in the field of distributed data acquisition systems. Okano Y, Mori S, Miyamoto S, Yamamoto H, "µR1000 Universal Intelligent Recorder", Yokogawa Technical Report, No. 17, pp. 14-20 (1993). 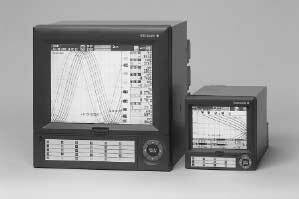 Kasajima Y, Komiyama M, Takahashi H, "µR1800 Universal Intelligent Recorder", Yokogawa Technical Report, Vol. 37, No. 2, pp. 51-54 (1993) in Japanese. The trade and software names that are referred to in this document are either trademarks or registered trademarks of their respective holders.